A couple of weeks ago Harri, 17, was working with us for a day. He got familiar with Art & Programming track on Mehackit Atelier. Check out what he has to say about creativity in programming - quite a few great points there! 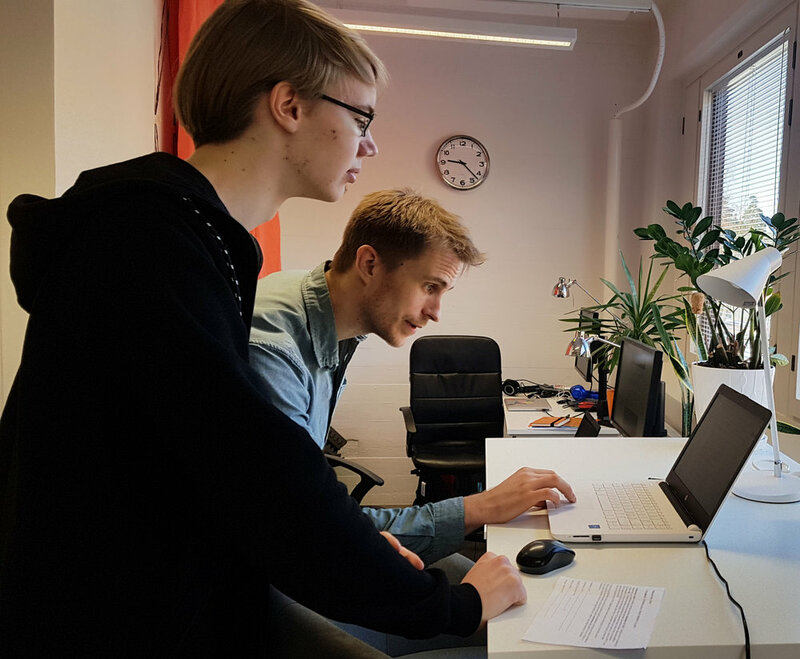 Harri and Mikko (our CPO) exploring Mehackit Atelier at Mehackit’s office. “Usually when you think about something creative, you think about drawing, painting, or music for instance. Programming probably isn’t among the first things on that list, if it even gets on the list. Still, programming is creative work. In programming you have to figure out how to implement something in a new, more valuable and more effective way - in other words, you create. Nowadays there’s plenty of talk about “thinking outside the box” and how it’s an important part of the creative process. When I tried out the Art & Programming track on Atelier, it really made me think outside the box by mixing together art and programming. The track and its assignments make you realise how programming itself is creative, not only when making art out of it. Often you may have a new idea, but don’t know how to carry it out. You may start making searches to find instructions for the various problems you have, but usually the ones you find aren’t exactly the ones you are looking for. However, creativity is not only about having fresh ideas, it’s also about combining parts of what’s “old” in a new way or in a new context. With the help of instructions and your previous knowledge you can put the idea into practice. In my opinion, skills for applying current know-how to an assignment in this way should be taught more. On Mehackit Atelier there was an assignment called “Speed of light”, and I got inspired to develop it further. I wanted the original project to look more like Star Wars Hyperspace. I added a background with stars, for which I made use of some of my previous knowledge. I also made the lines lighter and blue, and added some transparency so the stars can be seen through the lines. That’s how creative processes always seem to start: you have an idea and after the first implementation, you start to refine it. At least for me, the more I work with a project, the more development ideas I get. This process really doesn’t differ from when I get an idea for a new drawing. Interested in visual arts? How about music or electronics? Get creative when teaching coding or make coding a part of art and general studies - either way, Mehackit Atelier will make it easy for you!